When it comes to looking after our skin there are so many brands one can easily get lost in exploring, however the same cannot be said about children’s skincare and this fact continues to baffle me. Babies are born with delicate skin and using many mainstream brands can lead to all sorts of problems later – pediatricians are already alarmed by the rapid rise of skin problems like eczema. To come across a baby care brand that doesn’t contain mineral oils, PEGs, parabens, SLS, synthetic fragrances, phenoxyethanol is always a joy but have you ever come across kids skincare brand started by fathers ? If not, let me introduce Naif, a Dutch brand. Naif baby care was started in 2012 by two entrepreneurial fathers ( they used to work at Google and Unilever ), Sjoerd Trompetter and Jochem Hes, who weren’t keen on using mainstream baby care products on their children. They developed Naif with input from specialist formulators, dermatologists and more importantly, with feedback from other parents. At the moment there are seven products in the range, as well as four gift sets, including a starter kit and travel set, with the sun care line to be launched later this year. All Naif products were formulated in Switzerland with many ingredients sourced in Holland. Sjoerd and Jochem made sure that the packaging has universal appeal and was practical as well. I was particularly impressed when I met Jochem last December at the Babycino ShopUp ink Chelsea Town hall as he was truly animated and knew every single aspect when it came to each product. Men generally get involved in buggy or car buying, so to see a father who was concerned about his kids skincare is a wonderful delight and I hope that wonderful wind of change from Europe will turn into the sweeping wind of positive change. Key ingredients in all of Naif products are Sweet Almond Oil, Cottonseed Oil, Macadamia Oil, Avocado Oil & Camomile. Sweet almond oil was chosen for its nurturing & softening qualities and can benefit all types of skin, including sensitive, dry or prone to allergic reactions. Cottonseed Oil contains lots of fatty acids and works wonderfully in emulsifying formulas. Macadamia Oil helps to regenerate the skin and keep it supple. Avocado oil contains lots of vitamins ( including A, C, D, E & K ), squalene and minerals, is easily absorbed and helps prevent skin irritations, making it open of the most popular ingredients in skincare. I have so far tested three products from the range & must admit that my kids weren’t the only testers, I was a very willing volunteer as well, after all, if it is good enough for the kids, parents can benefit from it as well, making the products part of the family’s daily skincare routine. Naif Cleansing Washing Gel with natural cottonseed extract, 200 mls, £8: this clear gel has a light, fresh smell and you can apply it directly to the skin, squeeze some of it under the running water or apply it to the sponge. If you apply it directly to the skin and then add some water to it, it turns into a milky consistency. Kids like the smell of it and it makes skin feel baby-soft and smelling like freshly washed linen that was hung up in fresh air. Naif Milky Bath Oil with natural cottonseed oil, 100 mls, £12: having a bath is a wonderful ritual to bond with your kids, to discuss things that took place during the day and to nurture the skin while washing away the dirt and sweat. Add bottle’s cup full ( approximately 10 mls ) of the bath oil to the running water and twirl it around for the even dispersion of the oil in the water. The water will turn into a slightly milky colour and will leaf a light protective sheen to the skin, so you don’t need to apply a moisturiser to the skin after the bath with this oil. Its lovely flowery smell is gently uplifting and appeals to both boys and girls. Naif Nurturing Cream with natural cottonseed oil, 75 mls, £12: this cream feels rich, yet has a light consistency and gets absorbed fairly quickly into the skin. You can apply it after the bath or if the skin feels dry to the touch. It is suitable to be used on both face and body, just make sure you don’t apply it to your child’s face when outside or do it about half an hour before going outside. It comes in a handy flip top tube, making it practical for using at home or packing it into a baby or travel bag. 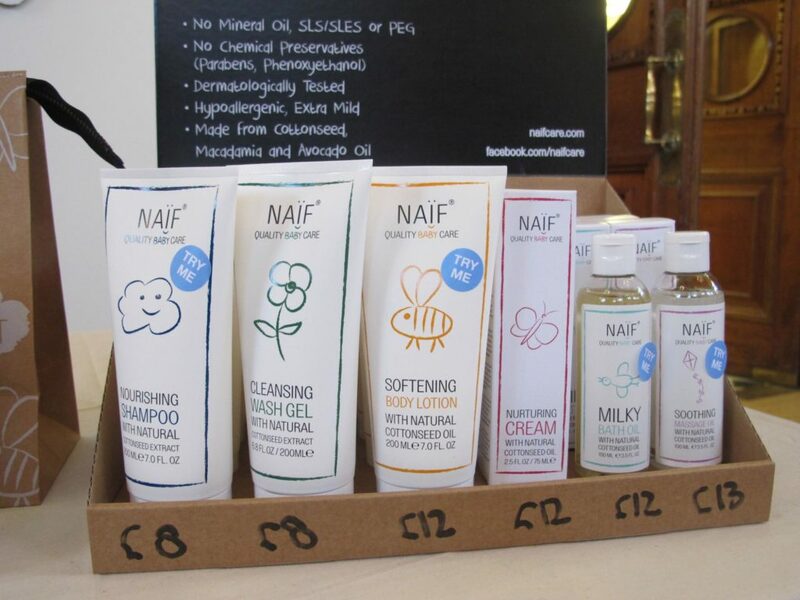 Currently there is a promotion on Naif products in Boots or you can use a unique code SJN151617 when placing an order online on Naif website to get a £3 discount.